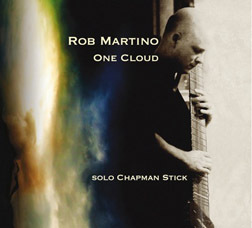 For hundreds of thousands of people over the last few years, their first encounter with The Chapman Stick has been Rob Martino's solo home-studio Stick video performance of his original, "One Cloud." This YouTube video has garnered over half a million views and hundreds of rave comments. Now, Rob has parlayed this success and his unique string tapping style and distinctive sound into a debut CD (also entitled One Cloud), striking a chord with viewers and listeners alike. As musical movements go, the contemporary progressive rock world may be relatively small, but its artists and audiences have created an enthusiastic and and vibrant scene, populated by dozens of culturally diverse bands (including the Mexican trio Cabezas de Cera previously featured here). Complex, densely orchestrated, and frequently polyrhithmic, much of the music harkens back to what are now classic progenitors like Genesis, King Crimson, Gentle Giant and, in the case of Rob Martino, Jethro Tull. Rob is unusual among progressive rock musicians in that he performs strictly as a soloist, creating these elements all at once with just his fingers, the strings and a few choice electronic effects. His music straddles the line between "progressive rock" and "folk rock", with each hand taking on its own guitar like role, making his Grand Stick sound like two big electrified acoustic guitars at once — one delving into the baritone/bass range, the other in the guitar range, with each playing chords, melodies, countermelodies, riffs and counter-melodies. 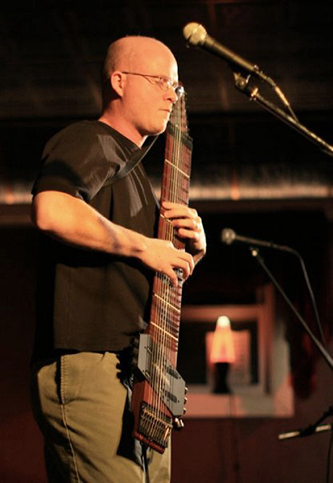 Unlike most Stick players, Rob uses a mirrored 4ths tuning, which allows him to apply the same exact techniques and movements, and therefore the same kinds of musical lines, in each hand. Greg: With your multi-instrumental background you could have gone in many different directions musically, what is it about The Stick that works for you as a composer and performer that you didn't get from other instruments? For most of my life I had little interest in solo performance. Much of my fascination with music had to do with arrangement and contrasts in timbre. So over many years, I developed a minimal level of skill on a variety of instruments and depended a lot on synth technology to put together multi-track music. When listening to and absorbing my various musical influences, I would come across a great guitar part, bass line, or keyboard part and feel compelled to learn it on its respective instrument. These various (mostly progressive rock) influences worked their way into the kind of music I was trying to compose. I started using a Stick in 1995, but only as an occasional piece in my multi-track music. However, I had a growing dissatisfaction with my "spread-thin" instrumental abilities, a lack of vision of where I really wanted my music to go, and a sense of being overwhelmed by the amount of possibilities with all these instruments and computer technology. It seemed like the more equipment and instruments I acquired, the less musically productive I was. Then in 2003 I got my first acoustic guitar and it was an unexpected and profound moment. Here was an organic, single instrument that was free from the bounds of electricity, something that had a rich quality of timbre that could stand on it's own in a solo context. While I did have previous formal training on acoustic instruments (flute and piano), there was something about the expressive quality of playing the strings directly and being able to "wear" and carry around the instrument that appealed to me. For the first time I was inspired to think about solo music, and it got me thinking about the Stick more seriously. At that point I wasn't sure if I wanted to focus on Stick or acoustic guitar - I found the acoustic nature of my new guitar a liberating idea, but what won me over with the Stick was how I could more easily adapt many of the ideas I was learning on a variety of instruments, and distill it into an approach on a single instrument. It combined the polyphonic nature of piano with the expressive possibilities of guitar. I can certainly still approach the instrument in an acoustic-like manner with minimal effects if I wish (like I do for most live performances) but there are still a lot of options for more color and processing if desired. Also, with the Stick, it seemed there was more potential to do something more unique in the music world, perhaps take the instrument into areas that hadn't fully been explored yet (rather than be yet another acoustic guitarist). Greg: I noticed that on your CD there is quite a bit more processing than on your YouTube videos, but it sounds very natural and highly integrated with the parts themselves. What kind of processing did you use, and what was your recording process, if you don't mind my asking? Rob: All the processing before mastering was done completely on the computer using plug-ins- a combination of built in effects that come with Logic Pro, Wave Arts (TrackPlug and MasterVerb) and Native Instruments (Guitar Rig 3). Almost everything was recorded as two dry tracks (bass and melody, while monitoring through my Fishman SA220) and mixed/processed from there, although there are some sections that I played through software effects in real time (like the intro to Conscious Dream). Once I had those dry tracks, I would add bits of subtle processing (both directly on the track, like EQ, and stereo spread, and some layered effects using auxiliary tracks) to add some additional tone shaping- sometimes there is a faint rotary speaker effect, or a delay). This kind of processing was done for the basic Stick tone throughout the album. For more processed sections like Cloud Dispersed, Turbulence, and the intro to Differential, there are more elaborate effects setups using Guitar Rig and some of the Logic filter and modulation plug-ins. Even in these situations the basic Stick tone is usually still there to some degree, but with a more heavily processed version happening in parallel on an aux track. Greg: Even among Stick players, your approach is fairly unique, as you're using an unusual tuning (mirrored 4ths). The article you wrote about the tuning goes into some detail on this subject, but if you were to encapsulate what this tuning does for you in a short answer, what would that be? Rob: There is a certain intricate and melodic accompaniment language available with the bass in inverted 4ths that suits the kind of music I like to play, which I suppose is very much rooted in the folk/rock (and to a lesser extent, classical) domains. Elements of bass and acoustic guitar come together to form an effective tapping style unique to the Stick- low root plus higher closed voiced chords, and scalar patterns within easy reach (making it feasible to hold down some chord tones while tapping or pulling off phrases on other strings). Greg: Tell me about the new Progressive Rock documentary, "Romantic Warriors". Rob: The film takes a look at the current underground progressive rock scene, with particular focus on the U.S. east coast, where a few significant festivals/venues are located (NEARfest, ROSfest, ProgDay, and Orion Sound Studios). There is some discussion about the challenges facing more experimental and adventurous musicians in today's mainstream music climate, compared to the 60s and 70s, when bands like ELP, Genesis, Jethro Tull, and Kind Crimson got more widespread recognition. Greg: So what's the next step for you? Are you already working on some new material, or are you focusing on doing more live performing? Rob: I'd say I have an album's worth of cover material already (lots of Jethro Tull tunes in particular!) and several more partially developed, I'd like to get some of those recorded for an album down the road, perhaps with some new originals (nothing of which is really more than embryonic at this stage). But right now I'm spending most of my musical energy polishing a 2 hour set of music, doing promotion and setting up more performances- I think getting up on stage, continuing to develop and get more comfortable as a performer is the highest priority for me now.